"An easy to use PDF converter for converting all of your important documents to the PDF format with no effort at all." Looking for a solution to your PDF woes? Primo PDF can convert all your documents to PDFs easily. With a plethora of options Primo PDF is one of the best solutions to converting documents, images, and presentations to PDFs. PDFs are easily one of the most used office formats for documenting important files in business environments than another other and has been for many years now. 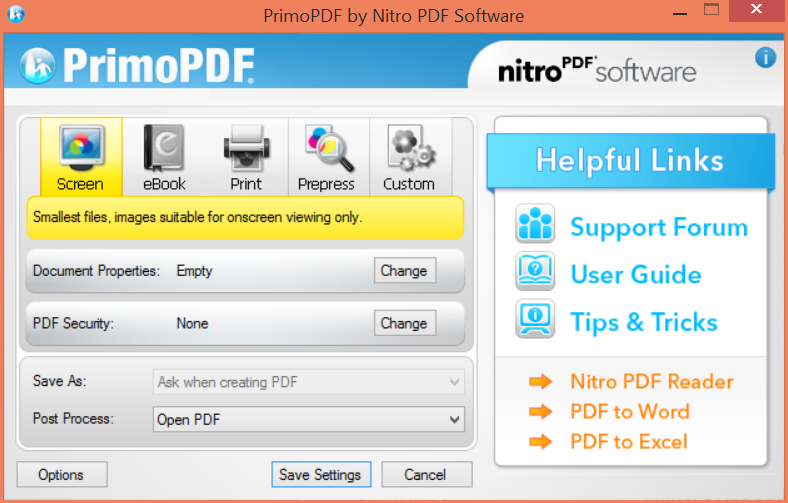 Primo PDF integrates with your desktop almost like a native folder. To convert a file to PDF, simply drag and drop the file over Primo PDF’s desktop icon. If you are running Windows 8, the file will save then open automatically in metro mode; however you can change this option in Primo PDF’s settings. You can even set Primo PDF to automatically open your mailing application to send your PDF instantly. A very simple to use and straight forward application to convert your files right away. 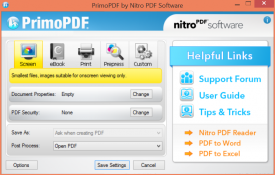 Primo PDF is light and fast, while also being very reliable. Right when you open the application you will know what to do right away since all of the options are presented to you right from the main interface window. All of the files you have documented will be presented to you right from the interface. Plus, a drag and drop conversion can't get much easier. Any document that is supported gets automatically converted right when you add it to your Primo PDF main directory. In other words, you don't need any advanced knowledge to use this software. Primo PDF has several options to adjust quality, set descriptions and apply passwords and permissions for secure access to your PDF.